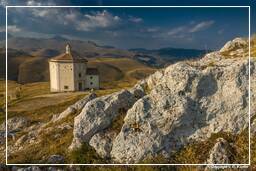 Abruzzo is a region in central Italy, its western border lying less than 80 km east of Rome. Abruzzo borders the region of Marche to the north, Lazio to the west and south-west, Molise to the south-east, and the Adriatic Sea to the east. Geographically, it is more of a central than southern region, though ISTAT (the Italian statistical authority) considers it part of Southern Italy, a vestige of Abruzzo’s historic association with the Kingdom of the Two Sicilies.